David R. Shlim MD ran the world's busiest destination travel medicine clinic in Kathmandu, Nepal, for fifteen years, and was the attending physician for all the survivors of the 1996 Mount Everest disaster chronicled in Jon Krakauer's Into Thin Air. He currently lives in Jackson Hole, Wyoming. "A simple and well-written introduction to the Tibetan variant of Buddhism. In folksy English, the book explains the basics of the belief system, including the concepts of impermanence, attachment, suffering, and emptiness. ...There are plenty of insights that will be worthwhile for caregivers. Medicine and Compassion is most interesting when it touches on Tibet's unique cultural traditions. For example, it provides a dramatic glimpse into another conceptual world in its descriptions of the process of dying, during which, according to Tibetan beliefs, the spirit moves through various bardo realms, where mind-consciousness is reincarnated. [...] A delightful book." "I was dumbfounded by how much Chokyi Nyima Rinpoche comprehends the emotional challenges facing doctors in relationship to their patients. He nails it time and time again. Magnificent! I shall continue to reread it just for the pleasure of the teachings, for the clarity of his mind, and the purity of his heart. This is a very worthy project." "Medicine and Compassion is a wonderful guide for caregivers to develop compassion and skill in helping others from their deepest heart. A very practical, easy to read, and much needed book." "Among recent Buddhist publications, Medicine and Compassion is unique in being directed at medical professionals. In it, Chokyi Nyima pairs homespun advice for providing the best possible care for patients with expositions on Buddhist understandings on suffering and embodiment. In the introduction, David Shlim, MD, discusses a common problem among doctors and health care workers, namely that they often erect an emotional barrier between themselves and their patients. Chokyi Nyima offers an alternative approach, one that applies the Buddhist training in compassion to establish bonds of trust in the doctor-patient relationship. Interesting adaptations of Buddhist principles are offered [on such subjects as] the art of healing and how to assist patients through the dying process. The book concludes with chapters that introduce the Tibetan Buddhist understanding of the death process and a brief overview of Tibetan medicine." "It would be a mistake to think that only an adherent of Buddhism could gain from reading, reflecting, and acting on this book's ideas. Medicine and Compassion provides practical guidance to anyone who seeks to become more compassionate." "This book will be of value to any health worker who has a sincere wish to help his or her patients and who wants to nuture that wish without burning out. It will also be of value to any health worker who once had this wish and would like to recover a deep sense of caring and compassion. There is also much of value here for those who care for the terminally ill. [The book should also be read by] anyone involved in the teaching of health workers, especially those who provide clinical care." "Like most doctors, I sometimes lack compassion. Once, as an intern, exhausted beyond caring, I discharged a favorite patient from the hospital despite his obvious downward spiral. My so-called excuse? I needed to lower my inpatient census! Today, almost 30 years later, I am still pained when I remember the baleful looks that he and his wife cast my way when he was readmitted the following morning. They knew that I had abandoned him, and so did I. That I can clearly recall such a moment is telling. 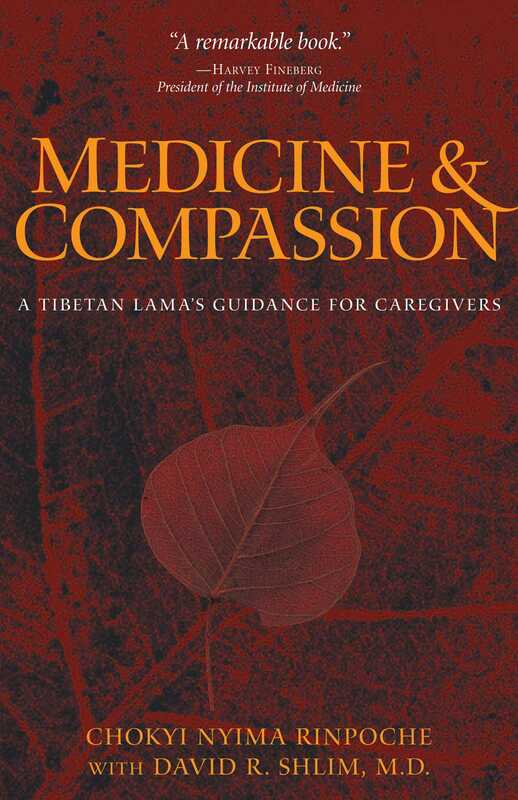 Medicine and Compassion: A Tibetan Lama's Advice for Caregivers is full of wisdom for any doctor whose well of medical empathy has at some time run dry. It represents the collaboration of a Tibetan Buddhist monk from Nepal and a Western-trained doctor, David Shlim, who first crossed paths when Shlim was director of the largest Western medical clinic in the Kathmandu Valley in Nepal. Shlim now lives in Jackson Hole, Wyoming, and has recently led several courses with his longtime friend and teacher. In writing this book, the two have tapped a genuine need in contemporary American medicine. The first section of the book touches on universal truths, as well as classic Buddhist teachings. However, a central theme of this section that is beyond debating is the profound influence of emotions and mental attitude on the experience of aging, sickness, and death. The second section of the book examines our potential for and various means of achieving a greater level of compassion. In the third section, come simple but profound thoughts on how to render the best possible care to all patients-including the aged, irritable, aggressive, or uncooperative- as well as how to nurture lifelong attitudes that ease the process of dying. The book ends with an overview of the 2500-year-old tradition of Tibetan medicine, in some ways a surprisingly modern "science" in its broad application to physical illness, bad energy or evil influence, and emotional disorders. Medicine and Compassion is easy to recommend, because it squarely confronts one of medicine's perennial challenges- namely, how to grow in wisdom and kindness, as well as in knowledge, and how to care for patients with all of the above. In my view, these matters are not given sufficient attention in many modern clinical purviews. In this data-driven, technologic era of doctoring, the spiritual focus is easily lost. Medicine and Compassion is a good reminder of the lessons that ancient teachings and contemporary religion can offer to our collective 21st century profession and to our individual humanity as healers."